Used as overhead cable to supply power, usually from a pole-mounted transformer, to the user's service head where connection to the service entrance cable is made. To be used at voltages of 600 volts phase-to-phase or less and at conductor temperatures not to exceed 75°C for polyethylene insulated conductors or 90°C for cross-linked polyethylene (XLPE) insulated conductors. 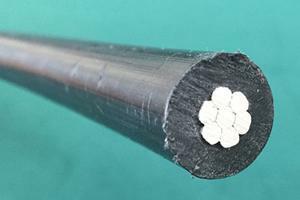 B-232 Aluminum Conductors, Concentric-Lay-Stranded, Coated Steel Reinforced(ACSR). 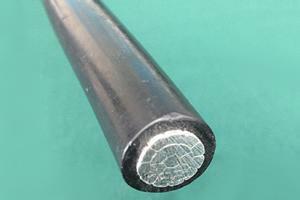 B-399 Stranded 6201-T81 Aluminum Alloy Conductors. B-901 Compressed Round Stranded Aluminum Conductors Using Single Input Wire. 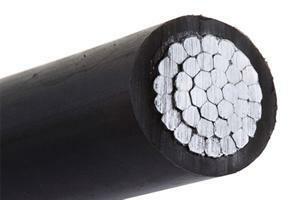 triplex service drop cable meets or exceeds all applicable requirements of ANSI/ICEA S-76-474. 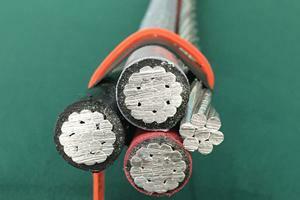 Aluminum conductors are concentrically stranded, compressed 1350-H19 aluminum. 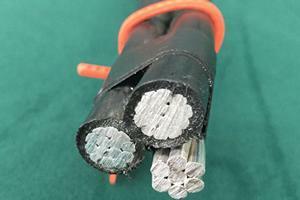 Insulated with either polyethylene or cross-linked polyethylene (XLPE). Neutral messengers are concentrically stranded 6201, AAC, or ACSR.